When Kevin Tuerff and his partner boarded their flight from France to New York City on September 11, 2001, they had no idea that a few hours later the world - and their lives - would change forever. After US airspace closed following the terrorist attacks, Kevin, who had been experiencing doubts about organized religion, found himself in the small town of Gander, Newfoundland, with thousands of other refugees or “come from aways”. 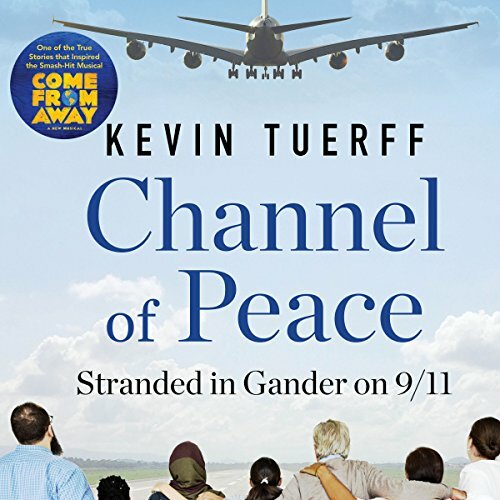 Channel of Peace is a beautiful account of how the people of Gander rallied with boundless acts of generosity and compassion for the “plane people”, renewing Kevin’s spirituality and inspiring him to organize an annual and growing “giving back” day. His story, along with others, has reached thousands of people when it was incorporated into the Broadway musical Come from Away. In Channel of Peace: Stranded in Gander on 9/11, you will find an unforgettable, uplifting tale of goodwill, the strength of the human spirit and hope. We were on a close-of-business deadline for preparing the first grassroots state water plan when the first plane hit. This happened before smartphones and the hyperactive interwebs we have today, so I heard about it in the hallway as I was coordinating various aspects of my group’s responsibilities on the plan. I knew there had been a small plane that had hit the World Trade Center once before and shrugged it off. Word then crept through the offices that it had been a jumbo jet. The folks in computing had hooked up a television, so I walked down to see what looked like a Hollywood movie because it was so unbelievable. Some grumbled of terrorists, but I thought that was premature. After the second jet exploded into the second tower, it was clear what was going on. Kevin Tuerff, author and narrator, notes in this book that folks of a certain age remember exactly where they were on 9-11, and that is undoubtedly true. Kevin’s experience was life-changing in that on a day that showed the worse of humanity, he experienced the best in Newfoundland. His story isn’t so much that he was stranded in Gander from a trip to Paris; instead, it's about how inspiring those rural Canadians were to him and some 6,000 other stranded plane people. The Gander story arcs through the book, but the longer arc is Tuerff's relationship with religion as a gay man and how 9-11 and a town good souls brought him back to the folds of the altar cloth. After he finishes telling much of the Gander story, there's a long Moses-in-the-desert-for-forty-years passage about finding his purpose in life that, just when I was wondering where he was taking me, he pulls it all together nicely. There's a sense of wonder and awe at what happened in Gander and what has happened since with Pay It Forward 9-11, interviews, a Broadway play, and now a movie. This book is a story of helping people and helping you to help people. It's a humanist response to terrorism as well as the temptation of soullessness--and the lack of humanity--that can permeate this modern world. It's a story that can re-ground you and give you hope.